Craftin' Caro: Time for another Designer Paper Share! Time for another Designer Paper Share! With Stampin' Up! holding a fabulous sale on their regular Designer Series Papers this month, this gives me an opportunity to offer you a Paper Share of all the new DSPs and pass on those savings...to YOU! 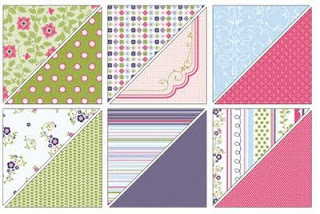 One 6x6" piece of every pattern and colour in the new 2011 In Colors - Designer Series Paper Patterns Stack! As a special exclusive bonus for MY CUSTOMERS ONLY, I'll also offer you a 6x6" sampler from the Hostess Rewards Designer Paper called "Cheerful Treat", which can not be purchased outside of placing a $200+ order. All it takes are 8 people who want to join in the share -- so be sure to email me if you would like to reserve your spot in this awesome deal! Pick-up price will be $40 CDN (includes HST & SU's S&H costs) -- please contact me for additional postage costs if you need it mailed out.